Best Study Timetable For Students of Class 6 to 12 – Time schedule, Studies! It has always been a contradictory topic. Most of us want to study and on the other hand there are also people who don’t even want to touch the books. But whatever the situation is, it is a bitter truth that you have to pass your 12th by hook or by crook. So that you can chase your dreams. Once a student reach 6th standard, they should start getting serious towards studies, because the level of studies start changing from easy to difficult mode. And this mode keeps on increasing standard by standard. So, you should set a schedule for yourself. In which class you study, that matters but timetable must be same for all classes and you will know the value of time when once you will start following the timetable. You will be punctual of the time. And this is very important to every students. Here you will get timetable for students who are under 12 and for both students one who are going tuition on daily basis, and for those too who don’t go for tuition and do self study. 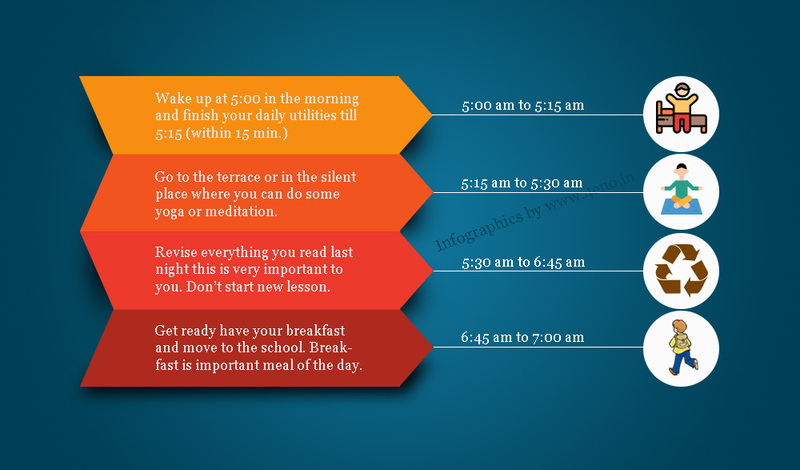 Keep every thing in mind and follow on your daily routine. Here we are providing you with a time table that you can follow. 5.00 am- You should wake up by 5.00 am and finish your daily utilities till 5:15 am. 5.15 am to 5.30 am- Go to the terrace and breathe the fresh air and do some yoga or meditation to fresh your mind and day. This is very important to you. 5.30 am to 6.45am- Revise everything you read last evening/night. 6.45 am to 7.00 am- Take a shower daily. It is very important to keep yourself refreshed all day. Have breakfast daily and don’t forget to have juice and fruits in your breakfast. It increases your energy to deal with all the tasks. We hope that till 3.00pm you will be home from school. Once you reach home, change your clothes freshen’ up and take 20 to 30 minutes rest. Till school we have discussed what should be exactly your time table. Now, let’s talk if you are a student who goes to tuition. We hope till 3.00 pm you will be home. Take rest for 20-30 minutes, after freshening up. Now, generally we go to tuition for 3 hours. 9.30 pm to 10.30 pm- Quick Recap of what you studied. As we have mentioned earlier, once you reach 6th standard, be ready for tough challenges. Be attentive and regular to your class and tuitions. Always maintain good notes and revise them regularly on the daily basis. When you are studying, be focused towards your studies only. Don’t get distracted. For students, meditation is always a good practice, try it. It will increase your concentration power. Study well, but don’t become so much nerd that you are studying during your recess and games period also. During that time, go out for games. It freshen’ up your mind. Give atleast 4-5 hours to your studies daily. In which atleast give 2 hours for practicing maths and rest of the time to your theoritical subject. After completing with 1 hour of study, takes 5 to 10 minutes break. When it comes to choose between two things at the same time, choose wisely. Understand what is coming in the top of your priority list and do that only. Start recognizing your strength, that what are you really good at. Whether it is, studies or extra curricular activities like painting, sports, dance or any other activity. If you want to excel in those, give time to them, so that, you can become perfect in that part. Once you are a high school student, now it is time to give yourself a wake up call. Why we are calling it a wake up call, bacause now this is the time when you have to decide what you actually want to do. In 11th standard you have to do the biggest judgement for yourself, for your future. Once you are a high school student, you are mature enough to make up your mind, what stream you want to consider for future. Don’t listen what the society says, listen to your heart. Understand which subject is your biggest strength, what is the best subject that you should opt for. This decision when you have to opt for your subjects is going to be a turning point for you, either it will take you to the heights of success or it will bring you to the bottom. Be fair enough to yourself. Recognise your strengths. Recognise what is your strongest subject and start preparing well for that. Don’t get confused that my friends are opting for science so i also have to. No, you don’t have to do what your friends are doing. If you are capable of opting for science, then only go with science. Don’t get hasty, that he is admiring to become this, i will also be doing this in future, he is admiring to become that, i will also be that. No, please just don’t do that. Your focus should only be on what you want to become rather, not what others want to become. If you find difficulty while doing judgement for yourself, feel free to comment down below. Our experts will try their level best to help you in any manner. Hello Arya, Work hard for your future, we will suggest your best option later, but stay in touch with physics and qualifying jee will be an advantage to you. Hello Switin, You are not young enough to tensed about it. Keep calm and try to find your interest first, in which thing you are more dedicate? Start doing meditation for 30 min everyday. And start noticing everything you are doing and what is the thing you have done perfectly. Might be these small notice of your daily life will give you some overview to make your career in. Hello Himangshu, If you want to study science and computer science, you can skip biology but maths is mandatory is you want to become your career in computer science field. Maths will help you to clear concepts and without maths you will not able to get selection in MNC. So, leave biology and choose maths and computer science it will help you. If you are aiming at becoming an IAS Officer, then you should go for Arts Stream. It will help you better in clearing your UPSC examination. Iam good at social pretty well that got 71/80 in preboard and 72/80in preliminary. My science is also ok that is 60/80 & 64.5/80 in preboard and preliminary respectively. I am average in maths improved it from 41/80 in preliminary to 59/80 in preboard. My interest is alot in architecture and then upsc. I am also interested and pretty know by robotics and artificial intelligence. What to do. Please help. I’m in 10th boards..
First you have to make yourself clear about what you actually want to do. Architecture and UPSC are two very different things. If you want to pursue your career in architecture than you must opt for science and if UPSC is your target, then arts stream will help you with that. Although, you may appear for UPSC after completing your B.Arch, but then there will be no use use of completing your graduation with B.Arch, because you can appear for it after pursuing your graduation with B.A. and it will be of a lot of use. So, first make yourself clear that what you actually want to do. I have a confusion that I want to become an IPS Officer but can I opt in +2 commerce stream as I am interest in this & please give me the path for becoming IPS and for my big brother:what are the future job possibilities in the commerce stream? Yes you can opt for commerce, but as you are determined of becoming an IPS officer, then this is my personal experience that arts stream will help you more. But go by your subject of interest, and as you are asking about future possibilities of commerce in itself is a vast field providing plenty of career opportunities. One can become a C.A. of an company, you can try for C.S., accounts, one can own his own business, bank and a lot more. So there are plenty of opportunities, just one has to be determined towards a particular goal. But I have a single question left in mind that what is the path to be a IPS Officer with Commerce? If you opt for commerce then it also okay, you can start your preparation after you complete your 12th. I want to develop my Mark to 90%. My 9th annual mark is 81%. This is good if you are so much dedicated for your 10th standard. Set a proper time table for your 10th standard and follow it throughout the year, be dedicated to each subject but also keep on practicing maths and science. Keep on clearing the concepts from the very beginning. We have given a proper time table in the article, do follow that, it will provide a lot of help. For more, drop down a comment below. sir,myself anu and i am studing in class 11 th i go to tution at 6 to 9 am after this i joint foundation and i reached 1 pm at my home what is right time table for me ? Once you reach home at 1:00 p.m., take 2 hours rest, then start with your studies at 3:00 p.m., i don&apos;t know your stream, but whatever stream you have choosen, like if you are a maths student start with your numericals first, the more you will practice numeric questions, the more your base will become strong. 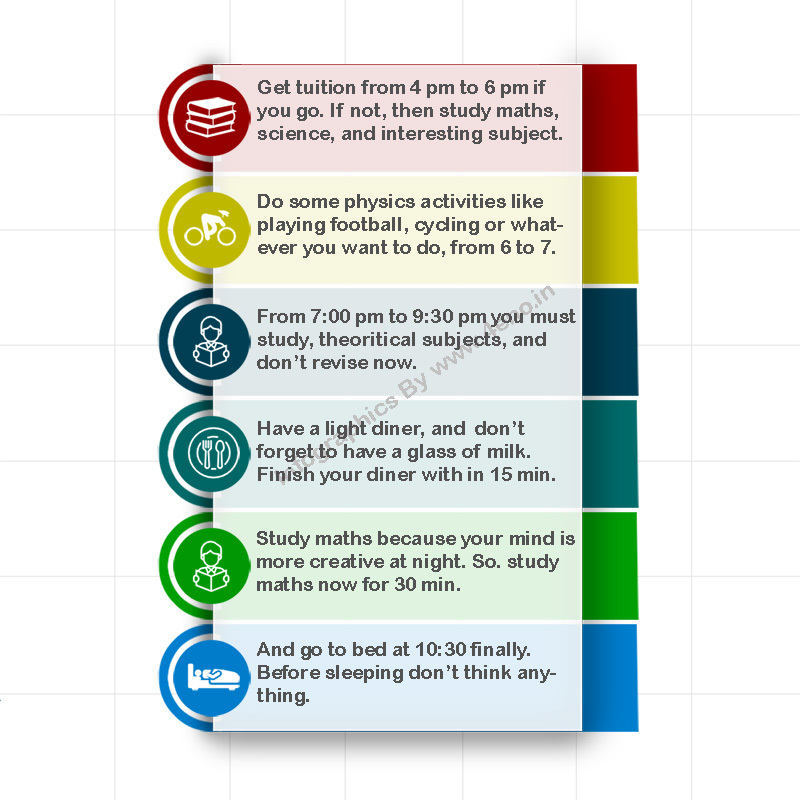 Give your practice at least 2 hours of time, then take a short break of 10 to 15 minutes, again start with your studies, and give them 1 hour time each, have dinner sharp 9:00 p.m., after having dinner, again start your studies at 9:30p.m., have a quick recap of what all you studied and then go to sleep by 10:30 p.m. Follow this time table, if it helps then please tell us. I am in class 7 and wanna make my base strong in Maths and Science, pls help. This is good if you are so much concerned about your examinations, and this is the only time when you can make your concepts clear, so that it will help you a lot in future. Practice is the only thing right now that you have to do, if you are facing any difficulty in any theoretical portion, then clear all your doubts, if you are not able to solve any maths question, then just do not immediately rush for the solution from any guide or internet, instead try it by yourself, if still you face problem, then ask your teacher for help. Whatever you study, it should be in a routine and follow that time table for ever. It will help you a lot. Good luck. If you want to score good in maths, then there is only one key and that is practice. The more you will practice maths, the more your maths will improve. Start working hard from today only, you will definitely make it through. Good luck. I used to be brilliant in maths till class 8. I never practiced math and Sanskrit before exams till then. I always got 99%-100% still. YES. 99%-100% without any practice. But in class 9 last year I didn’t score well even after heavy practice. Similar case is in class x currently. My term 2 are near and I want to be back to 99%-100% . what should I do? I have 30 days. Hey Divyansh, You might have known, now syllabus has been upgraded and you have wide syllabus now (in class 10th). As you are saying you used to score 99% to 100% in class 8th means your basic concepts are very clear. So, you don’t need to work more on your basic concepts. What is important now is Formulas and important syllabus for exams if you want to score more then 95%. Just practice hard, Set goals and work on it. Revise your syllabus and when you will clear every chapter and topic, I hope you will come to your previous record. My child is in 6th standard.nowdays in 6th standard there are total 7 subjects five main and two elimentary . Iam very confused that how child study each subject everyday . It can possible , if possible than how. Hello Utkarsh, In which class do you study? I am not able to follow the time table for morning please suggest me what to do. BUT OUR TEACHERS HAD SAID THAT”WE COUNT THE MARKS IN WHICH WE HAVE TOPPED”. SO HOW CAN I BE PREPARED FOR TERM-1. GIVE ME A IDEA ABOUT TINE TABLE. I am in 12th class… I want to become a chemistry teacher in kv.. What should i do? Concentrate on the subject, make it one of your strong subjects, after completing 12th, go for B.Sc, then M.Sc, and clear the exam CTET. Good luck. Hi I am in class 8 i am not too good in studies so pls provide me a time table and I have interest in maths,science,computer and englishso pls tell me what should I do for later gob. Hello Nandana, You are little bit late to ask this question. But anyway, If you dreamed about civil services and you should not choose biology, still you have chosen biology in +2, don’t worry it is not irrelevant. You have another option, choose Arts in graduation. You are just in class 11th so no need to worry about it. You have more than 4 years to fill application form for Civil services. You just follow the study timetable or our another article how to score good marks in exam and pass +2 with quite good marks. Remembers your marks are not going to help you to in the civil services. Only your knowledge will help you. Best way to make 70+ is, study your favourite subject and score good in these subjects. If you find science is difficult for you and it has vast syllabus then how come you complete your dream of civil service. Instead of thinking and assuming them difficult, make set your mind and assume them that all the subjects are easy. Instruction to improve your condition is, Revise your syllabus more than 4 times before final board exam. and Release pressure, Motivate yourself always. Motivation and good thoughts will release pressure. Focus on study instead of focusing on bad situations. thank you. Hello Reva, Thanks for giving me a chance to suggest you, You are in 7th standard, so this is the perfect age to learn something, English is not only important for study, It is different language and you must learn one different language. Now, I only want to suggest you to listen english songs, Watch english movie, read english news paper and take help from google or dictionary. Don’t hesitate to speak. You will only get habitual when you will speak it, listen it everyday and get surrounded by. Reading and listening will improve your english. i come home at 2 pm and have tuition 5-7 and i have sport from 7:30 to 8:30 my concepts are clear but i have problems in numericals. can you sugget a good timetabe? Hello Adya, Our mind work efficient in night time and it become more creative so you must practice after your sports or after having light diner. Yeah, There is no problem if you are weak in Maths and Physics, your biology must be strong. You will have to qualify NEET examination to get admitted to medical courses. Which field more interested choose it. Sir I am in 8th standard.. And I have heard that if we set our goal in Early age it’s good for our future but I don’t have a goal.. I am good in maths and English.. please suggest me a goal..
And one more problem if I try to study concentratedly.. I get distracted easily.. I am an average scoring 10th grader. I am confused about what to opt in 11th. Hii Sir, Iam in 11th standard of Humanities and next month I will give final exams.Then what can I do to became a IAS or Lawyer. I am in class 10 right now and my tuition timing is from 3:45pm to 6:45pm. So could you plz suggest me a good schedule. Hello Kalp, You are already studying enough. In the school and after that at the tution. You start reading after 7:30 pm till 9:30 then have your dinner and go to your bed. Early in the morning at 5:00 am wake and them follow the post’s morning timetable. How can I became a painter?